Barbuda, part of the two island nation Antigua and Barbuda , is located in the Lesser Antilles in the Caribbean. It is one of many Small Island Developing States being seriously effected by climate change. Stronger, more frequent hurricanes, coral reef death, diminishing marine biodiversity and pollution (plastic marine debris) are having a direct effect on Barbuda's environment and people. with registered 'not for profit' status under Antigua and Barbuda's companies legislation, BRC is committed to preservation and conservation of heritage and environment through education initiatives bringing together local stakeholders in collaborative ventures with interdisciplinary international scholars. 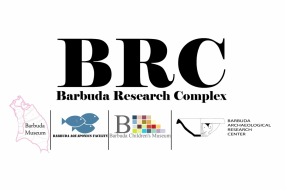 BRC includes the Barbuda Archaeological Research Center, Barbuda Museum, Barbuda Children’s Museum and the Barbuda Aquaponics Facility. BRC bridges natural sciences, social sciences, humanities and the arts along with Traditional Ecological Knowledge (TEK) and citizen science in a dialogue of discovery and innovation striving to support Barbuda’s cultural and environmental integrity and seeking to ensure relevance and ownership of research on Barbuda by Barbudans.